There's been an awful lot of talk lately about GMOs, their "artificiality," and whether they are or are not the next great plague upon humanity. 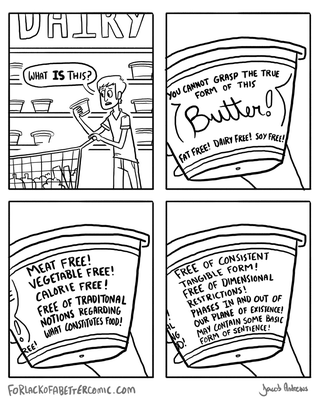 Which is silly, because what we really, truly should be talking about when it comes to food and its "realness" is the nature-defying, space-time violating scourge that is artificial butter flavoring. These are grapes. Yes, really. Thank you, For Lack of a Better Comic, for the much-needed wakeup call.